Mansfield and the FUELSNews team’s thoughts are with those affected by Tropical Storm Harvey. After making landfall on Friday, Harvey continues to ravage the Gulf Coast, with estimated rainfalls nearing 30 inches in some areas of Texas. Baytown, TX has experienced some of the heaviest rain, receiving 34.36 inches of rain as of this morning. Rainfall is expected to continue over the next few days, and meteorologists are now calling this the “worst flooding disaster in U.S. history.” Harvey was the first Category 4 hurricane to hit the U.S. since 2004. 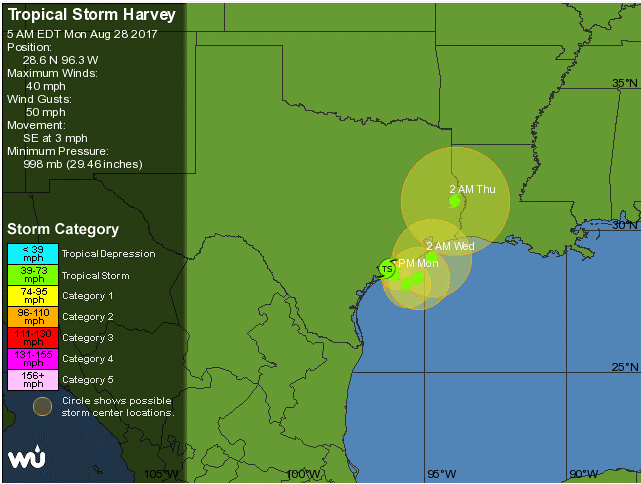 Downgraded to a Tropical Storm after making landfall, Harvey was the longest lasting named storm after making landfall in Texas since 1971. The storm is currently caught between two high pressure regions, keeping it in place for a few days before it moves. Meteorologists expect the storm to briefly return out to the Gulf Coast before returning and driving through East Texas and Louisiana. For more analysis on the storm patterns, check out the Weather Channel’s analysis here. From a fuel supply standpoint, the storm has significantly impacted short-term supply, though the effects on long-term production are yet to be seen. Locally, Mansfield’s supply team is on code red for San Antonio and Houston supply, where the rain damage has been substantial. Corpus Cristi is on code orange, as some terminals have come back online already, with limited spot availability. Texas and Louisiana both declared states of emergency prior to the hurricane reaching landfall. Virtually all refined product in the Southeast is fed by the Colonial pipeline, which originates in Houston and terminates in Linden, NJ. With Texas production reduced, product shipments along the pipeline to states such as Georgia, South Caroline, North Carolina, and Virgina could flow at a reduced rate. The refineries that feed the Colonial pipeline have not been significantly impacted yet; however, if Harvey gains strength over the Gulf before hitting East Texas, Beaumont and other major refining areas that feed the Southeast could come offline, causing a larger geographic impact. As the storm makes its way east, an additional 850 kbpd of refining capacity in Houston is in jeopardy, per GS research. Ports in Texas have also been closed, cutting off the flow of oil imports and exports that traditionally flow through the region. Whether these impacts become long-term concerns will not be known until refiners attempt to restart production. Assuming no major maintenance issues, prices should normalize over the coming week as production comes back online. However, if any major refineries experience extended delays coming back online, consumers along the East Coast could feel the impact. Mansfield’s Supply and Operations teams are diligently watching the supply situation and will update customers as new information becomes available.